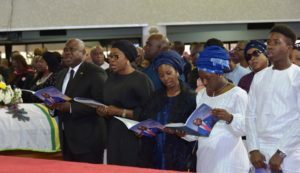 Lagos State Governor, Mr. Akinwunmi Ambode, his counterpart in Ogun, Senator Ibikunle Amosun and wife of Nigeria’s Vice President, Mrs Dolapo Osinbajo on Tuesday led thousands of friends, family members, colleagues and well wishers‎ to pay last respect to late Deji Tinubu who passed on last Thursday. At a well attended lying in state and funeral service held at the Redeemed Christian Church of God in Victoria Island, Lagos, tributes, eulogies and tears poured in freely for Tinubu, who until his demise was the Special Adviser to Governor Ambode on Commerce, Industry and Cooperatives. Deji had slumped while playing a novelty football match with some members of the State Executive Council at the Jubilee Chalets in Epe on January 25, 2018. In a special tribute in memory of Deji Tinubu published in the funeral service brochure and signed by the Secretary to the State Government, Mr. Tunji Bello described him as a great professional who devoted time to the service of humanity. “He was an engineer, but he was also an engineer of sports. He was both sports man and sports lover. But he was unforgettable as a sports administrator. Those who followed him knew him as a symbol of service to humanity. “We had seen him enliven us on television screens and through radio waves. He was an enthusiast and an analyst. He probed the game and predicted. He pointed out weaknesses and strengths. He saw flair, he saw style, he celebrated goals. 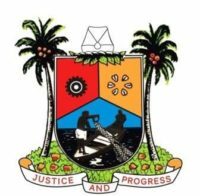 He delighted in them and infected all who listened or watched him with his full vigour and vitality about living,” the Lagos State Government said. Speaking at the service, Amosun described the late Deji as a man who had a deep passion for football and sports in general. “The last time I saw Deji was when he came to identify with Segun Odegbami’s 10th anniversary of his sports academy‎. Little did I know that Deji will answer the final call on January 25 which happen to be my birthday. Deji was full of life and had a deep passion for football,” Amosun said. He commiserated with Governor Ambode and the State Government, adding that Deji’s call to glory was ‎an act of God. “‎God’s ways are not our ways, when it happens like this, we have to thank Him. With all what has been said about him clearly shows that we have to be thankful to God for his life in the 54 years he spent with us,”Amosun said. Wife of the Vice President, Mrs. Yemi Osinbajo who prayed for the family of the deceased, urged them to take comfort in God, while praying that God will sustain his wife and chil‎dren. In his sermon, Pastor in Charge of RCCG, City of David, Idowu Iluyomade said Deji was a quintessential gentleman and a pillar, who contributed in no small way in building the h‎ouse of God. “I have known Deji for 22 years. He was a giver and a lover of football. To the family, I want you to take solace in the fact that everyone of us will die or be raptured. Today we celebrate Deji because we know he’s in a better place. Nobody took his life, he died at the appointed time,” he said. Taking his sermon from Isaiah 43 verse 2,‎ Iluyomade urged the congregation to see Deji’s death as a reminder of the futility of life and the need to submit their lives to the almighty God. Among other dignitaries present at the service include‎ President of Dangote Group of Companies, Alhaji Aliko Dangote, former governor of Anambra State, Dr. Peter Obi, Senator Olorunnimbe Mamora, Mr. Dele Momodu, Senator Tokunbo Afikuyomi, members of the Lagos State Executive Council, Body of Permanent Secretaries, members of the Lagos State House of Assembly, sports aficionados, among others.